'Tell me your company and I will tell you what you are' - A very known phrase but true. The company we keep, sooner or later defines us. It was a Tradition in India, perhaps practised even now in some remote places. Before finaizing on a Marriage proposal the relatives of the Bride and the Groom would enquire into the family history of the last seven generations for both families. That was for getting themselves and the families wed to each other but 'This' is an 'Eternal Marriage' - The marriage to the Divine, and hence all the more important for us to be aware of the Lineage because that is exactly what defines the very foundations of our Spiritual Quest and its Ultimate fulfillment. 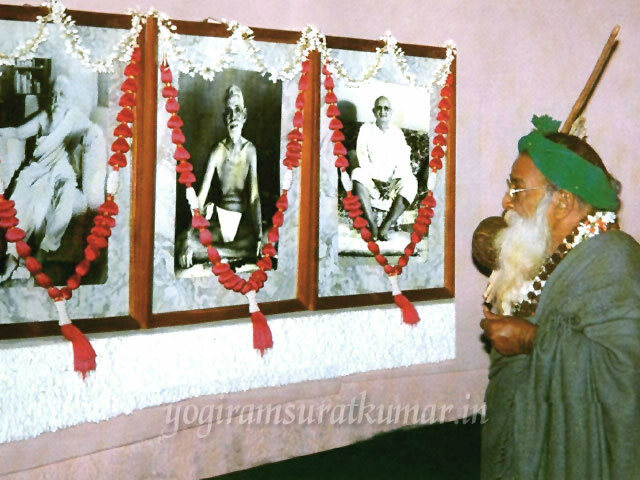 'Yogi Ramsuratkumar' was whittled by what He used to call as 'His Three Fathers' indicating the mighty lineage of His Ancestry, were none other than Towering Spiritual Giants - Sri Aurobindo, Ramana Maharishi and Swami Ramdas. It is They who caused the Ultimate transformation from 'Man to Superman', within 'the beggar' who we know as 'Yogi Ramsuratkumar' today. "It was Sri Aurobindo who brought this Beggar to the South. This Beggar knew He was a revolutionary, took part in freedom fight earlier, and stayed in Pondicherry. This Beggar’s Life would not be complete if they are not mentioned properly. When this Beggar entered Sri Aurobindo Ashram, there was so much peace all around. Then this Beggar understood, THAT PEACE was Sri Aurobindo.It is not a question of whether this Beggar met Sri Aurobindo physically or not. It is how they influenced Him, how they moulded His Life that is important." “Swami Ramdas is this Beggar’s Guru. HE was initiated by His Father Balakrishna Rao. Balakrishna Rao was initiated by a sanyasi from Udipi whose name is not known, though Swami Ramdas had help from Ramana Maharishi and Hubli Siddharuda Swami. (To the woman devotee sitting opposite), these three people, Sri Aurobindo, Ramana Maharishi and Swami Ramdas had great influence on this Beggar’s Life. This Beggar owes His very Life to them. Swami Ramdas gave this madness to this Beggar. There are other people who have influenced Him also. But these three are totally different. One day, Yogi Ramsuratkumar rather shyly, decided to ask the Master to bless him with the Grace of initiation. Without any rituals, Swami Ramdas with a deep smile asked him to sit down before Him. He gently asked Yogi Ramsuratkumar to repeat along with Him the sacred mantra “Om Sri Ram Jaya Ram Jaya Jaya Ram”, syllable after syllable. Swami Ramdas asked him to repeat this mantra all day and night, all 24 hours. The Cosmic Universe, with all the Celestial Bodies revolving and evolving each moment, they are nothing but the Cosmic Manifestations of the Lord. The millions of galaxies and its suns are all but a creation of His Divine Leelas (Plays). When the Lord Himself reincarnates in a Human Form, such a manifestation is known as the Satguru. To dwell on the stories and the sports of the Divine Manifestation, uplifts and inspires the devotees to be in awe of the Glory of the Lord. Such aspiration opens our hearts towards the fulfillment of the purpose of being born as a human, granting us the blessing for the attainment of the Supreme or Liberation. Yogi Ramsuratkumar is no ordinary Saint. It would be very difficult to describe (in a matter of words) the Splendour and Grandeur of His Presence. What can be spoken here doesn’t justify the truth and reality of the magnificence of Yogi Ramsuratkumar. Just like one can’t describe the vastness of the Cosmos. We can only wonder about it, who or what Yogi Ramsuratkumar was, is or will be is a matter best left for contemplation. The Truth is, when God Himself reincarnates in a human form and comes in front of the devotees, there is an irrefutable Grace that is bestowed upon the entire Humanity and all Beings everywhere. Such a Grace that uplifts, inspires, loves, Liberates, Enlightens, reveals to us the very purpose of our Existence and helps towards its fulfillment, such a Grace is Yogi Ramsuratkumar. Around the age of twelve, the young lad had a very interesting experience that led to an irreversible spiritual transformation. He was drawing water from the well, when he noticed a chirping bird on the other side. An impulse arose in him and he whipped the rope striking the bird dead. This discomforted him tremendously as he tried to revive it but in vain, finally releasing it into the waters of Mother Ganga. The experience of the death of the bird struck a chord deep within the pained heart of Ramsuratkumar, hence prompting him to inquire into the mystical nature of Life and Existence. After finishing his secondary education he pursued further studies in Lucknow, and became proficient in English Hindi Urdu Bengali and worked for some time as a teacher in a school. Due to some experiences unfolding during that time, he left his profession to pursue his calling. After a while of living a marital life, Ramsuratkumar again left home in search for the Guru for the fulfillment of his spiritual aspiration. In November 1947, Yogi Ramsuratkumar arrived in Sri Aurobindo Ashram in Pondicherry and had the darshan of the great Sage, Sri Aurobindo. After His visit to Pondicherry, He came to Tiruvannamalai and had the darshan of the Great Sage, Ramana Maharishi. Yogi Ramsuratkumar had heard of Papa Ramdas also, and had visited Kanhagad but did not feel attracted to Swami Ramdas then. He returned to North India and again came back to Sri Aurobindo Ashram and later to Sri Ramana Ashram where he stayed for two months. It was during this time Yogi Ramsuratkumar felt tremendous Grace of the Master. It was not until a few years later that Yogi Ramsuratkumar arrived in Tiruvannamalai, hence initiating the Master’s Work into motion whereby eventually people came to recognize Him as the Satguru. Tiruvannamalai has been known for the Mystical Saints, Yogis, Siddha Purushas hence it would not be justifiable not mentioning the Grace bestowed by Beloved Master Yogi Ramsuratkumar. 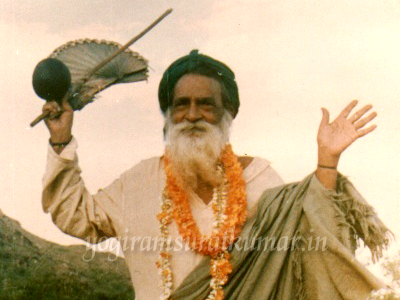 Yogi Ramsuratkumar attained Mahasamadhi on 20th February 2001. Those who have truly known Him, have known Him as a Living Presence, unrestrained by the strains of the Mortal Form. They have known and felt the Grace that radiates. Yogi Ramsuratkumar always was, is and will be. The Guru never dies because the Guru is not just the physical form. The Guru is “That” which goes beyond the conventions of manifestation. The Grace that radiates is beyond the body. It is said the Liberated ones are truly beyond the nature of death, for what dies is only the Form but the Presence continues on hence even today we feel the tremendous blessing of His Presence in our lives, helping us, guiding us, transforming our lives, urging us to move deeper into Realization and awakening. May His Grace be with us all. 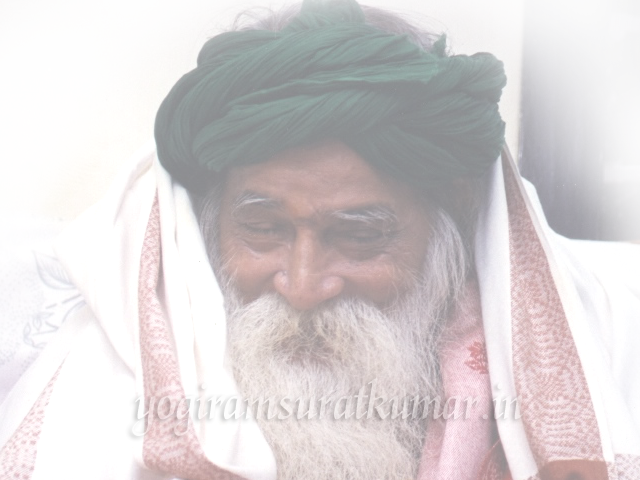 Yogi Ramsuratkumar Yogi Ramsuratkumar Yogi Ramsuratkumar Jaya Guru Raya. It was only seven years later, after travelling all through the vastness of India, that Bhagawan arrived at Tiruvannamalai, the land of Lord Arunachaleshwarar. Yogi Ramsuratkumar spent much of His time around cemeteries, the verandahs of vessel shops and temple grounds as well as within the embrace and topography of The Holy Hill Arunachala. Bhagawan would incessantly work for the benefit of others, constantly working with uplifting the state of the simple folk around. Healing, ailing blessing, guiding and loving all who were open to His Grace, He worked very hard for the benefit of others and enriched their lives with His Kindness and Compassion and Father’s Grace. Yogi Ramsuratkumar met with violent resistance from several political sources who, very intensely, resented His Presence in Tiruvannamalai. One such incident as described by Him, speaks of the brutality that He, with such patience and simplicity, quietly endured. He was brutally thrashed by a group of rowdy thugs who threw away His coconut shell, fan and paper bundles, leaving Him totally bruised and hurt. Another time He was attacked by a similar group of people who demanded Him to Hail the glory of Tamil and condemn Hindi as per their wishes, due to the prevalent political disharmony between the northern and southern parts of India. He would sometimes be charged at with stones or even have glass pieces thrown in His direction in the dark of night. Despite all these attacks, being who He was, being Supremely compassionate and benevolent, Yogi Ramsuratkumar silently withstood all the resistive forces, with an earnest eagerness to ensure that his Father’s Work proceeded unhindered in any way. Yogi Ramsuratkumar compassionately worked for the benefit of Humanity, always pleading all those around Him to chant the Divine and Sacred Name of The Lord in whatever Form they wished. He would beg His Father, for the welfare and highest benefit of all beings. Dressed in rags, He did not seek any personal comfort for Himself. He would smoke cigarettes, one after another, absolving all the evil sins, bad karmas, maladies, illnesses and ill mental tendencies that troubled His devotees. Yet, as described by many, none could ever have the faintest smell of the smoke whilst they stood around or beside Him. Infact, the entire atmosphere would be filled with innumerable Divine Fragrances much to awe and surprise of everyone! He would rarely bathe, this ritual merely including the sprinkling of a few drops of water over His face which later on ceased all in all. The totality of His focus remained in His Father’s Work all the time. His hands would often be seen making the gesture of the index finger moving against the thumb, almost as if there were an invisible japa mala present in His Divine Hand. The movement was rapid that it was impossible for an ordinary human to perform such an action. Every event that took place in the magnanimity of His Presence, was no ordinary event, but rather, the manifestation of Father’s Cosmic Work. Therefore, sometimes, even if simple objects like cups of tea placed before devotees, were moved in the slightest manner, one would find the most stern, most severe and sometimes, enraged Form of Yogi Ramsuratkumar before their very eyes! This often left those around Him, in a rather mystified and horrified condition! If He would ask for tea or coffee for all the devotees present, one would be amazed to find that the order thus placed by Him, would be the precise number as that of the people present, never mind how small or large crowds might be. As Yogi Ramsuratkumar Himself would say, “The entire world is this Beggar’s Ashram.” It certainly did not matter, in which part of this world an event was to occur, but if it entailed Father’s Intervention, Yogi Ramsuratkumar, far in the small town of Tiruvannamalai, would be aware of it, as if it were playing out before His very eyes! It was during the year 1976, that Yogi Ramsuratkumar, after much persuasion and the continuous prayers of His Devotees, granted them His consent and moved into the Sannidhi Street Residence, offered to Him by his well wishers and devotees. The tiny house called “Father’s House” was a small cottage with a gutter situated at the outer wall of the construction. There was never any cooking done within the premises of this house as Bhagwan would still depend upon the chance meals that came His way by the Grace of His Divine Father. Even here, He met with much resistance by some people often resulting in Life threating situations. These people would sometimes throw glass pieces into the narrow passage of the house which would lead to the toilet. The glass pieces would inevitably find their way into the soles of His Holy Feet, leaving them full of blood. Despite all these efforts, none were successful in their attempts to dishearten Yogiji who fervently worked for the benefit of others, carrying out Father’s Work most devotedly. Soon, Yogi Ramsuratkumar gained tremendous popularity and people from all walks of life besought His Divine Countenance, Guidance, Love and Protection. Be it Spiritual seekers or those who lived their lives in the world, all were granted endless Grace by this Compassionate Master. During Darshan, people felt and most certainly were aware of the constant transmission that was bringing about an unexplainable transformation in every aspect of their lives. Both, within themselves and around they were aware of the Endless Grace of the Master working its way through and through. He alleviated all dire and difficult situations uplifting the pain and suffering of innumerable souls. Such were the miracles that took place in His Presence, that one would find severely handicapped people walking absolutely free, out of His Presence, cancer afflicted ones found themselves absolutely cured after His Darshan. Illnesses such as diabetes were instantly cured by His Grace. Bhagawan Yogi Ramsuratkumar lived His entire life within the precincts of Arunachala. In a truer sense, they are inseperable and One only. It is upto Humanity today, to Realise the value of such Grace of the Masters and take the advantage of their Presence upon this planet. Unless these Gracious Masters chose to reveal themselves, we will not know or recognize their Greatness and Magnificence. Bhagawan Yogi Ramsuratkumar had once remarked and revealed a Truth regarding who He really was. He had mentioned that, “A Being like this Beggar comes only once in 500 years on this planet,” hence subtly indicating to us, what we cannot recognize, even today – the value of His Divine Presence among us. May His Divine Presence grace our lives. Let this be our humble prayer to Him. It was during His Divine residence in Sannidhi Street that had a young dog name Sai Baba. 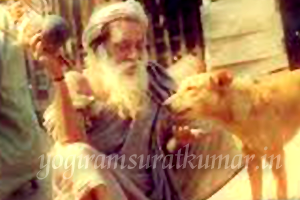 This dog, just as the Name declares, was filled with devotion towards Bhagawan and loved Him dearly. Such a pure love filled Master and disciple relationship, that he would run to Yogi Ramsuratkumar each time he was called out. Others who might refer to him as ‘Nai’ meaning in ‘dog’ in Tamil would hear Bhagawan saying to them, “ No, not Nai, but Sai!” When Sai Baba – the ‘Sahai’- the helper, left his earthly body, he was given a well respected and honorable burial as per Yogi Ramsuratkumar’s wish. Thereafter, there was another dog, named Sai Baba, the second, who joined Bhagawan’s group of devotees. He too, served Yogi Ramsuratkumar in his own unique way. However, he met with a very tragic death, conspired by the same violent group of people and yet won the Grace of The Master.